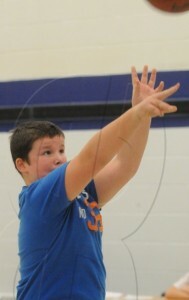 Cole Seaton of Assumption Catholic School shot for the hoop during the annual Aylmer Knights of Columbus Free Throw Championships in Aylmer, Thursday, Jan. 30. He placed second in the 11-year-old boy division. Nearly 50 youths 9 to 14 years old from local schools participated.